There’s a reason the holidays are called “The Giving Season.” People feel compelled to reach a little deeper into their pockets at this time of year. Our favorite causes benefit from the giving spirit we feel near the end of the year. iHeartDogs supports a number of different causes. This year, we’d like to ask you to help us save lives this holiday just by continuing your holiday shopping. Adoptable pets fill shelters all over the country. Many of these pets were loved and then discarded. Some were lost and never found. Others never knew the feel of a real home. Shelter staff want nothing more that to empty their kennels and find every single pet a home. But in many facilities, the clock is ticking the moment a dog or cat sets a paw inside. When time is up that pet is put to sleep. iHeartDogs believes every dog matters. There’s a family out there for every shelter pet – they just need the chance to find the right one. There’s something we can do about it. Together, we can save lives this holiday. Second Chance Movement™ gives shelter pets the time they need to find their home. When you make a purchase from the Second Chance Movement™ Collection, you’re helping rescue teams fund missions to save animals from high-risk shelters! These rescue groups move dogs and cats out of shelters where adoptable pets are euthanized, and transport them to areas where they’re quickly adopted up by families who were waiting for their local shelters to get pets. Second Chance Movement™ supporters have already funded over 128,000 miles of transport for pets. You can save lives this holiday too by joining them. And you can do it while you shop for your friends and family this season! In June 2016, police and animal control rescued Pippa from a nightmare situation in a Riverside County house. Twenty-seven skinny dogs, including Pippa, were removed and taken by animal control to the San Jacinto Shelter and held as evidence. In August after only a few weeks in the shelter, Pippa was placed on the list to be euthanized. The Shelter Transport and Animal Rescue Team (S.T.A.R.T.) leapt into action to collect signatures to keep her alive and buy her time until they could reach her. It worked, and in September of 2016 they were able to take her out and transport her to a better life. 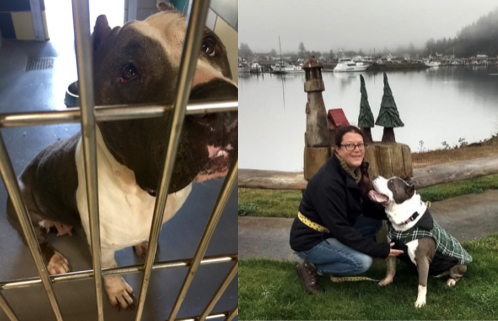 The Burgess family in Oregon adopted Pippa, giving her story the happy ending she deserved! Tuco was found as a stray and taken to the San Bernardino County Animal Shelter. But once his stray hold was up, he’d be in danger of being euthanized if not adopted. S.T.A.R.T. board member, Linda R., had a friend who saw his shelter photo online and immediately fell in love with him. She reached out toS.T.A.R.T. for assistance in bringing Tuco to their family. After several phone calls, and with the help of a local transporter, the stars aligned and Tuco went to his new home in Woodland Hills, CA. Liberty was at the Lancaster Shelter in California. She was not only petrified and shaking in her kennel, but she was also pregnant. This was a special rescue for the Shelter Transport Animal Rescue Team (S.T.A.R.T. ), as it took a great deal of teamwork to get Liberty out of the shelter and to safety. She gave birth the day after she arrived in Washington State to eight healthy puppies who all found their own forever homes! Today, Liberty is loved very much by her new family, and she even has a four-legged brother to play with every day. Shop the Second Chance Movement™ and save lives this holiday season!